Hiya blogsters! I’ll be getting to the “Safety Before Socialization” post soon as promised, but just wanted to interject something here. My goal is to hopefully write shorter, somewhat less meticulous, but more frequent posts from now on. So, if I’m a little rambly, or less than grammatical, so be it. You’ll all have to forgive me. Life with one of these little learning machines is a full time job! Gotta stay on the ball to make sure he’s mostly learning what we want him to. Today I was mentioning to my morning client about this whole puppy board and train situation, and he innocently asked something along the lines of: “So, how does that type of training work? Do you allocate a couple hours per day?” Of course, I understood what he meant. For regular training clients I do charge an hourly rate, and then I’m out the door. Job done. But in this situation, with a real live pup scampering around, it’s 24/7, Baby! Other than the little stinker’s total collapse /crash out time which usually starts at 11:00AM, and goes until 4:00PM, there is no off switch. No time clock. No punch card at the end of the day. No predictable put your feet up and pour a glass of wine time (unless I want to start drinking in the middle of the day that is–hmmm…not a bad idea really :)). Puppies are non-stop learning machines! And when they are not learning, they are sleeping—that all important downtime I keep talking about which is probably when their little super-developing neurons are busy processing all that learning they are doing the rest of the time. Anyway, so much has happened with Zydeco since his arrival, honestly it feels impossible to document everything fast enough. It’s getting a little frustrating because any time something cool happens, or a breakthrough training moment, or just good baseline footage where it doesn’t go all that well, I’ve usually got my pajamas, or underwear on, and by the time I’ve run my fingers through my hair and the camera’s on, the moment has passed. 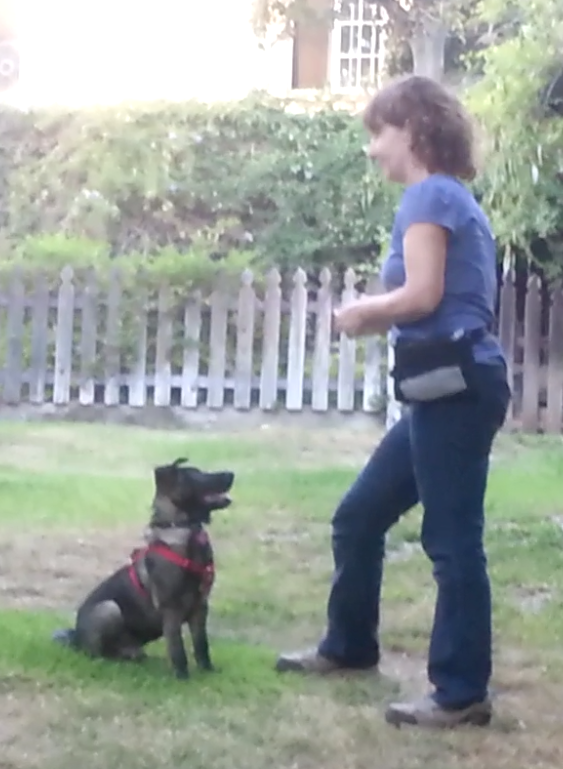 Training sessions for Zydeco are happening basically every waking moment he is in observation-and-treat-tossing range, and all of this is mostly done completely on the fly. There are canisters of treats all around the house, I’ve got a pouch of treats on my hip just about all the time, clicker always on the belt loop, fridge stocked with everyone’s daily rations dolled out the night before in advance (because, don’t forget I’m reinforcing the other two dogs for acceptable behaviors around the puppy too)….Oh, my kingdom for a small documentary film crew that could magically follow Zydeco around, catch it all in stunning HD, add the great soundtrack! … And of course do it all without upsetting him…Oh well, a girl can dream. Just for posterity, though, I’d like to list a few gems that happened this morning (many of them before 7:00AM, and I am not even a morning person for goodness sakes! ). Most of it not caught on film, because frankly I just couldn’t get organized in my pre-caffeined, bleary-eyed state. 6:30AM. Zydeco’s usually gentle mouthing on my hands and arms suddenly got real. Okay, now I get why this behavior is a problem for people! OUCH! Up until this morning I’ve been trying out a very low-key, least rewarding response to our boy’s little oral fixations, holding very still and making my arms super boring. This was working fine till now, but these bites I just could not tolerate, or really allow him to continue to do in good conscience. So there I was in my PJs with gleeful shark teeth flashing at me. What to do? Hmmm, first thought that came to mind was: tether him and get out of range… which then of course quickly sparked a small temper tantrum about being restrained. No worries. We got through it. I kept all my fingers and toes. Z. experienced the hard truth that a chew proof tether really is chew proof. Lesson learned. Lets get puppy redirected more quickly next time onto something else to nosh like a marrow bone BEFORE he’s suddenly locked and loaded on my arms as his new favored playthings…and maybe a little more ex-pen time in the wee early hours of the morning. 6:40AM (Still no coffee yet!!). Tried to walk away to get the pot on, but had made the mistake of un-clipping the tether because I thought Z. was over the tantrum at that point. Ha ha! Clever boy! Tricked me. Now it was time for attack the feet! Yeeeouch! Okay. Okay. Nothing like needle teeth on bare feet first thing in the morning on 5 hours of sleep! 🙂 So now he had officially reached what I call “You are lucky I love you” status. I decided before I lost patience, it was time for a little crate practice. In ya go, buddy. Here is a handful of treats and a nice bone to keep ya company. 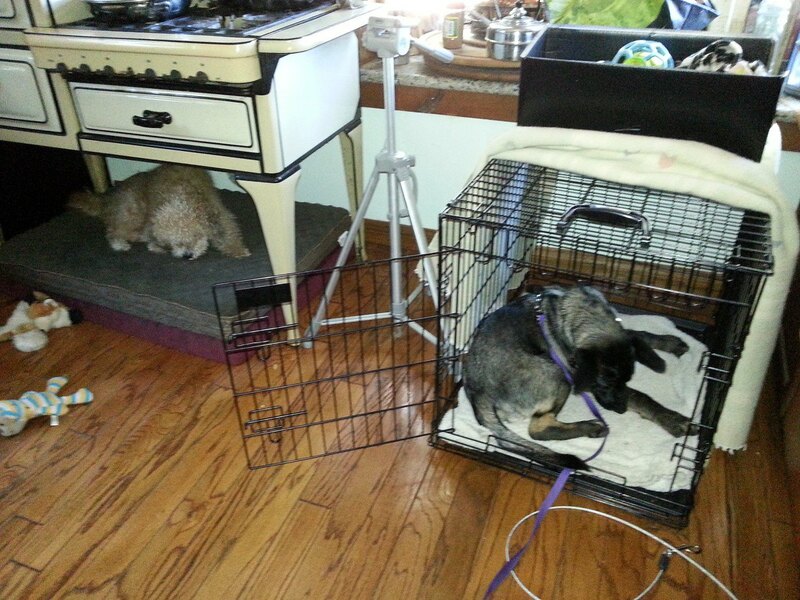 But in his crate, Z. was not having it. He began scrabbling at the door, shrieked for about 5 minutes, then settled in a hopeless slump, sighing dejectedly, as if all the world were minutes from the end and all was hopeless. 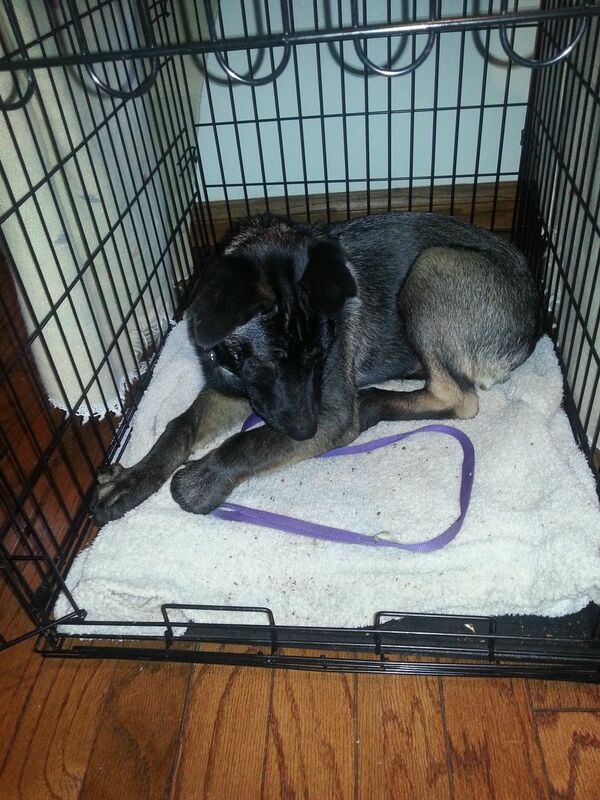 Dejected flop in crate. Note the untouched marrow bone (a super, high value food item). He’s quiet and calm, but far from happy. 6:50 Finally! I now had my darn cup of coffee in my hand at least, and all feet and hands safe….but what I didn’t have was a very good association going on with that crate. Z. was clearly not enjoying any of the high value marrow bones or treats I had put in there to sweeten the pain of confinement, a sure sign that in spite of his apparent calm state at that point, he was stressed. 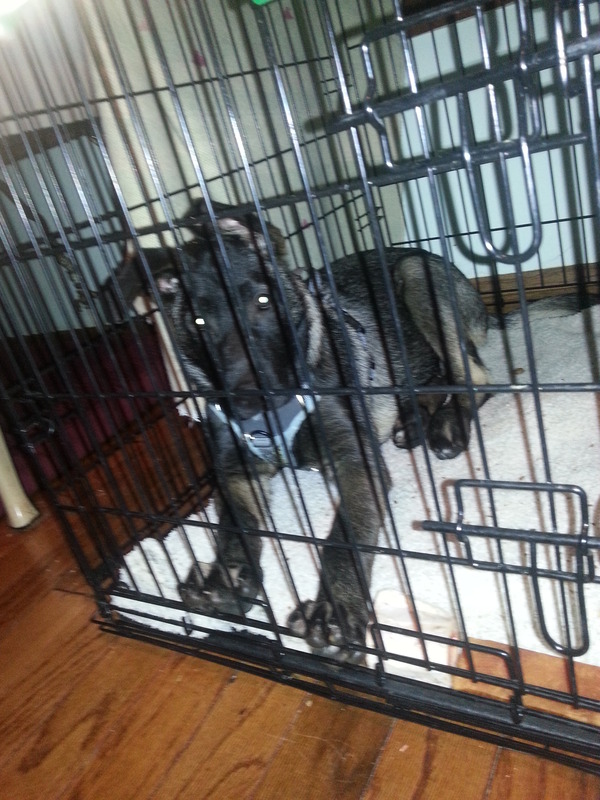 But at least he was quiet, so I let him out. This time he stayed mellow. No more foot attacks. 7:45AM Surprise surprise. Guess what I had now? 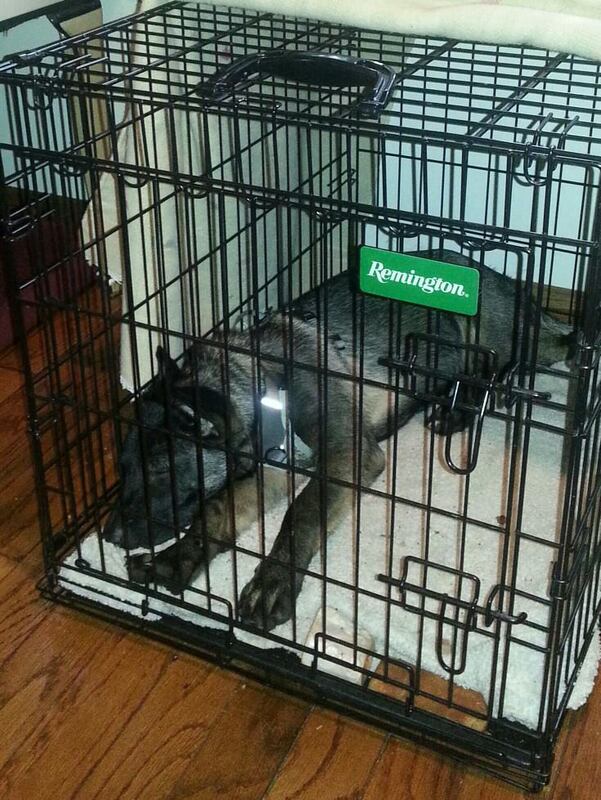 A relaxed puppy curled in his crate with the door open–all on his own. YAY! Breakthough! This I did at least manage to snap a few photos of. 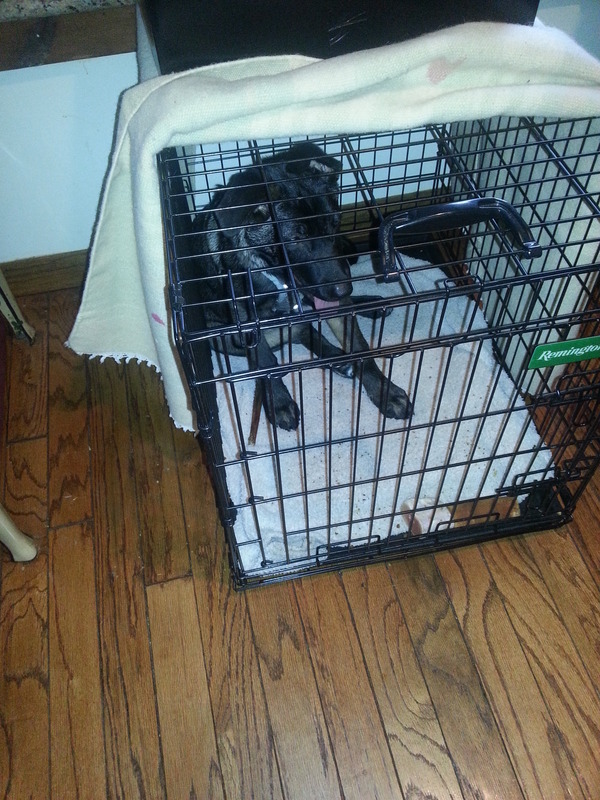 Zydeco offers to go into crate on his own–JACKPOT TIME! 8:00AM Excellent interactions with Maya (which I supervise so that I can click and treat all good choices): curving around her instead of body slamming–CLICK! Rising up to almost mount her, then hopping down–CLICK! Running full tilt boogie right at her, but then swerving at the last minute (the daredevil!)—CLICK! Sniffing noses, then going off about his business–CLICK! Responding to a warning snarl by play bowing and then shaking off—CLICK! By golly he’s learning to be a real dog! This session I managed to catch, but the jiggly, handheld camera footage is certainly less than elegant. Oh well. Somewhere in a later post I’ll show where he was with this a few days ago. The improvement is huge! Maya is actually tolerating him now because he no longer tries to use her as a personal trampoline. 8:15 Five minutes of a fantastic, quite joyful retrieve game with a paper bag crushed into a ball tossed back and forth across the kitchen floor. Excellent enthusiasm. Brought the item right to me each time. No keep away. No mistrust. Never once tried to eat the bag! Impressive! He’s a natural! 8:20AM Worked through a brief barking fit as mom came downstairs. Look at That and the “Hi Zydeco” greeting game (more on that later), plus deli turkey was very effective. In minutes he was happily taking treats from her and they were enjoying a tug game together. I was able to leave the house with him hanging out with his new “auntie” supervising. YAY! Appropriate socialization in action! One more person to add to his family crew! WHEWEE! So, that was the morning. Can you see why I’m having trouble keeping up?